Barbie Glamtastic Fashion Set Purse Cell Phone Ring Sunglasses & More New! Good for the price and shoes can be modified if they don't fit. YOU DON'T HAVE TO THROW AWAY SHOES THAT DON'T FIT. YOU CAN FIX THEM. I saw some reviews about some of the shoes being too small and people thinking their only option was to toss the shoes in the trash. I had a problem fitting some of the shoes on vintage Barbies, but they still fit on a Hannah Montana doll, so it really depends on the brand of doll. I don't understand the logic of buying something just to throw it in a landfill, even if it was something supercheap. It's not like they're taking up a bunch of space in your home, and chances are that you or someone you know might have a doll they will actually fit. Most of the shoes I received were a good size. I found that the ones that don't fit can be modified easily by snipping off the straps with an Xacto knife or scissors. Most of them still grip the dolls foot without the strap. Since you're willing to wait over two weeks for delivery, why not take another five minutes to make the wait worth it? I was very disappointed when I got the shoes. Less than half of them fit the Barbie dolls, even the ones who have smaller feet than normal Barbie dolls. Most of the shoes were too small or broke when I tried them on the dolls. Not worth your money. I give this product 2 stars because they delivered it fast and almost half the shoes are usable. I guess you get your moneys worth as this is cheap and obviously made out of cheap plastic. 12 pairs fit my granddaughter's Barbies, 8 pair didn't. It is still a good value for the ones that she could use. Some shoes are really small and do not fit. But overall impression is great! My daughter loves them! 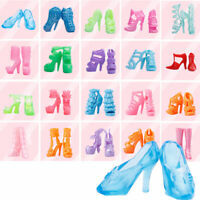 Good selection of shoes, but some are the same pair of shoes, only in a different colour. Several of the shoes did sadly not fit the standard barbie doll. This is why I would not recommend this product, unless you do not mind throwing some of the shoes out.